Although several important nonlinear physical phenomena were studied before the 1970s, some (synchronized clocks, the N-body problem of planetary motion, and hydrodynamics, for example) going back to the early days of Newtonian mechanics, many more have recently been discussed as new phenomena were discovered and the mathematical connections among them realized. 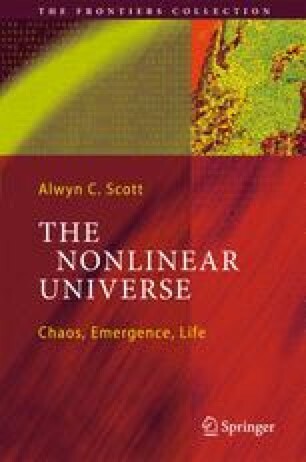 While not a complete survey, this chapter aims to put some of the recent results into perspective, so the reader will appreciate how broadly the nonlinear concepts introduced in the previous four chapters are now used throughout the physical sciences. Beginning with the very small (theories of elementary particles) and proceeding to the very large (cosmology), the emphasis is on verbal and visual descriptions, avoiding detailed mathematical discussions for the convenience of the more general reader.